Whether you need a powerful video publishing platform or a simple video gallery, it all comes standard with PHP Melody - The original Video CMS. New Release: PHP Melody v2.7.3 is out now! See what's new, try the live demo or get your license. PHP Melody is a self-hosted Video CMS which evolved over the last 9 years. SEO optimization, unbeaten security and speed are advantages you no longer have to compromise on. Whether you're creating a personal or business video site, PHP Melody gets the job done. This is a no fuss CMS, fit for 2019. Reassuringly solid customer support (9 years and going). Pre-defined ad areas (header, footer, player, etc.). Detailed statistics and graphs on ad performance. Target any ads (classic, pre-roll, etc.) based on categories, sources, users, etc. Set how many listing you need for your content. Adjust the video players, thumbnails & avatars. Change the color scheme of your video site to match your brand. No code code editing required. Since the first release of PHP Melody (9 years ago) one of our top 3 priorities was SEO. That hasn't changed since then. It takes just 3 clicks to add videos from YouTube.com, DailyMotion.com or Vimeo.com. That's true. Using the official APIs, you can search, organize and retrieve any video you want; in bulk or one by one. Whether you’re creating a niche video site or a personal video gallery, when it comes to importing videos, there is no substitute. PHP Melody started out as a YouTube importer back in 2007. That's just one year after Google paid 1.6Bn for YouTube. Importing videos with PHP Melody. PHP Melody works with all your favorite video formats: flv, avi, mkv, divx, mov, wmv and mp4. The multi-part upload process guarantees uninterrupted uploads every time. Planning to upload 3GB files? No problem, because there are no file size limitations. However, be mindful of your disk space requirements and make sure that you hosting account has enough disk space. Planning to allow your users to upload videos? No problem. Registered users can add their own videos. The approval process can be fully automated or moderation-based. Furthermore, you can limit how many videos each user can upload/day or the size of each upload among other settings. Unique to PHP Melody are the built-in presets for 40+ of the most popular video sites. This means that adding videos from Dailymotion.com, VK.com, Vimeo.com, etc. is done automatically for you. Copy/pasting data is not required when adding videos from any of the 40+ supported video sites. But what if any of those videos is taken down or no longer works? For that purpose, we've built the video checking bot which automatically checks the health of your entire video collection and reports problematic videos. You won't find any other Video CMS that can do this. Embedding videos not covered by our "automatic video embed" presets can be added to your site the old fashion way. Embedded videos are tightly integrated into your site's back-end and front-end. There is no difference when it comes to managing or displaying them on your site. Broadcast live to the web and mobile devices alike any RTMP stream. Bundled with PHP Melody are smart and capable video players such as FlowPlayer and JW Player. They enable live streaming of any RTMP feed. For example, you can use your Wowza Media Server to stream content directly onto your site. There's no other software to install or configure. Add your RTMP link and PHP Melody will take care of the rest. Similar to any other videos, live streams can be protected or made available only to registered users. We examined the leading blogging platforms and distilled their best features into our Article Module. You'll find the easy to use Article Module is an excellent way to publish your content right from the PHP Melody dashboard. Keep a blog, publish articles and create custom new pages by enabling the built-in Article Module. There is no learning curve and no extra software to install. Update your pages anytime, anywhere because you only need a browser to do so. With a few drag-and-drops, you can also upload photos, videos or attachments to your pages. What was a chore is now a pleasure. Your pages can be updated anytime and from anywhere. Create and manage new pages without editing any files. Delegate your publishing tasks to your team thanks to the many user roles. Since PHP Melody supports a multi-author site, adding editors or more administrators is always easy. As your site grows you will be prepared to delegate publishing tasks to your team or hired freelancers. If your SEO strategy includes article publishing, you'll soon this feature indispensable. Control over how much access editors receive is, of course, adjustable. You can even restrict them to publishing only new articles and nothing more. Move your site beyond comments and into 2019. Having a good SEO is simply not enough these days. The only way to create a sustainable video site is by giving your users the tools to make your site great. Offer your users the choice to express and interact with your site because, if not, they might find someone else who does. We truly believe that a social component is indispensable for any CMS. That's why the Social Module is included in every PHP Melody license. You can disable this module but it may well be your “secret weapon” for 2019. The “follow“ button is at the heart of the Social Module. Just like Twitter, your registered users can follow, share and interact with each other. A “suggested users” list is custom tailored to each person after registration. This list is based on location and a few other factors to offer relevancy and encourage interaction. Exponential growth is sure to follow if you allow your users to make friends and build profiles on your site. And because one size doesn't fit all, every aspect of this feature is highly configurable. Static sites are boring because they appear uninhabited. To prevent this from ever happening to your site, each user has an 'activity stream' on their profile. Information which matters to them: their comments, followers and how their content is rated will appear in their stream. Just like on Facebook, any item can be 'liked', notifying the people involved. Users can also express themselves by posting status updates which are in turn broadcasted on their followers' activity stream. As administrator, you have a cool activity stream in the back-end dashboard. From it you see and control all the activity that happens on your site. Important notifications about the user are instantly broadcasted to them, wherever they are. Activity related to the user's content will appear next to his avatar. Clicking it will show the recent activity history and who did what. It's all done in real-time. As an administrator, you can tweak every aspect of the social module, including which notifications your users receive or not. Each registered user has an advanced profile page within your site. This gives users an overview of their account, video submission, friend activity and everything else about them. They can also update their avatar, post status updates access their favorite videos. All this without leaving their profile. What's characteristic to the social module is that they can post messages on their timeline. This works exactly like Facebook or Twitter does. Messages posted on their wall/profile are broadcasted to their followers. 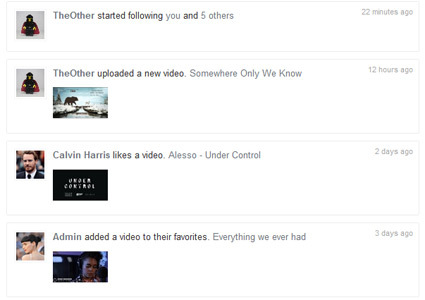 Followers get notified about this in their 'Activity Stream' and they can reply, and 'like' those status updates. More than 9100 people use PHP Melody to build video sites. Join them today! The installation is well documented and simple to follow 2-step process. 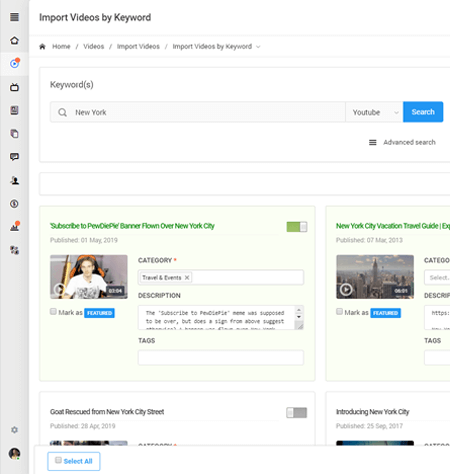 You're now ready to publish, manage and monetize your videos. Super-strength security. Zero sites hacked in 9 years. Continuous updates & improvements. 31 major updates so far. Reassuringly solid customer support; 9 years of track record. With PHP Melody you can create a video site without any costly investments in servers or VPS instances. PHP Melody is efficiently designed without any bloated code or needless MySQL queries. This means you can run and scale your video site flawlessly on any hosting platform which meets these basic requirements.